So, you think you’re good enough to be a member of the U.S. Army Delta Force team? You think you can “fast-rope” out of a helicopter? Sure, nothing to it. If that’s something you could do, perhaps you could possibly be good enough for the team ... if it even exists that is. Delta Force’s “membership and activities are highly classified.” In fact it’s so secretive only a handful of government officials even know how many individuals are in the unit. In 2011 the Pentagon ordered them to find Osama bin Laden. It looked like they had him in Tora Bora, but not so fast. The man they thought was him wasn’t, but the unit “continues to be one of the United States’ greatest weapons against terrorism.” The SEALs were the special ops team who eventually nabbed bin Laden. Terrorist activity began to pick up in the 1970s and Colonel Charles Beckwith was convinced the United States needed a “counterterrorist group.” The highly secretive Delta Force was born, a group patterned after the British SAS. They are supported by other units and individuals such as “medical staff, logistics experts, and signalers who specialize in radio communication.” Do you think you could spot a member of the Delta Force by their uniform? If you do, you just might be mistaken. You’ll also learn about the types of vehicles they use, their training, the Night Stalkers, their weapons, the infamous House of Horrors, and you’ll learn many other fascinating things about this elite operations group! 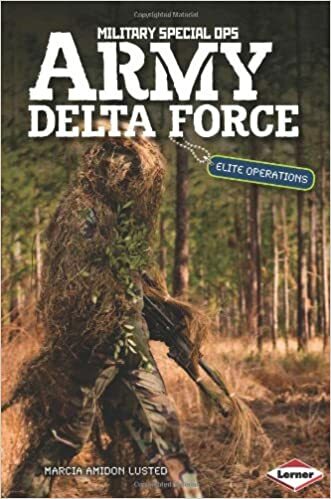 This is an excellent overview of the Army Delta Force young readers will love. The layout of the book will be a big draw for many readers, especially the reluctant ones or those interested in special ops. The book is generously illustrated with full color photographs, one black and white of Beckwith, and one of a WWII British SAS team. There are numerous informative sidebars and captions that add to the text. For example, one discusses a “Mission in Focus” about the movie, Black Hawk Down. In the back of the book is an index, a glossary, and additional recommended book and website resources to explore. Quill says: If you have a youngster who is a fan of military special ops, the Military Special Ops series will definitely draw them in!